To say that the Game of Thrones season 7 finale was packed with intense action and dramatic revelations would be an understatement of dragon-sized proportions. "The Dragon and The Wolf" saw Daenerys Targaryen finally come face-to-face with her arch enemy Cersei Lannister, confirmed beyond all doubt that Jon Snow is the child of Rhaegar Targaryen and Lyanna Stark and capped off proceedings with The Night King using an undead dragon to bring down The Wall. Perhaps the most significant death in the episode however, was that of Petyr "Littlefinger" Baelish. The notoriously conniving leader of The Vale was desperately trying to worm his way into the affections of Sansa Stark by driving a wedge between her and her sister Arya. Just when it appeared that Baelish had got his wish and Sansa was going to put her own sister on trial, the Stark children revealed a conspiracy of their own and turned the accusations around on Littlefinger himself, with Arya happily dealing the fatal strike. Despite the significance of this scene, the episode didn't reveal how exactly Sansa and Arya had come to see through Baelish's schemes. "We actually did a scene that clearly got cut, a short scene with Sansa where she knocks on Bran’s door and says, “I need your help,” or something along those lines. So basically, as far as I know, the story was that it suddenly occurred to Sansa that she had a huge CCTV department at her discretion and it might be a good idea to check with him first before she guts her own sister. So she goes to Bran, and Bran tells her everything she needs to know, and she’s like, “Oh, s—.”"
The inclusion of such a scene would have provided an explicit explanation as to how Sansa and Arya came to settle their misgivings about each other and concentrate on Littlefinger as the enemy in the midst. However, it also would have confirmed another key element of the narrative: that Bran Stark knows far more than he's letting on. Bran's role as the Three-Eyed Raven has given him vast knowledge but the youngster has seemed very selective about which pieces of information he shares. 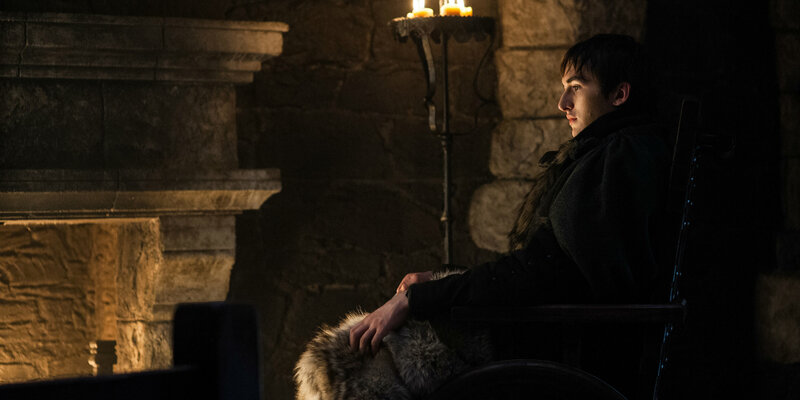 Had the scene Isaac Hempstead Wright speaks of been retained, it surely would've had viewers questioning why Bran didn't inform Sansa of Littlefinger's treachery prior to being asked. It's likely that the primary reason for cutting this scene however, was that it would've done away with the surprise element that made the finale events in Winterfell so dramatic. Although some viewers may have seen the twist coming, Sansa's sudden, public turn on Petyr Baelish was a fist-in-the-air moment - but this impact would've been greatly lessened had things been explicitly set-up in a previous scene. Furthermore, the final cut of the sequence did enough to indicate that it was Bran who revealed the truth to Sansa, rendering the removed scene unnecessary. Game of Thrones season 8 is expected to premiere in mid-late 2018 on HBO.